For the easily distracted of a certain age, detouring down the arts and crafts aisle at a local pseudo-superstore - popped into after work for just 3 things - translates to 'dinner may not be a wholesome 4-food group affair'. Because the artsy 'toys' of our childhood are comeback kings (no surprise, since our persistent wheedling and begging made them legends the first time around) & they are distraction ready. My adult self with money in pocket resisted the impulse buy inclination of my inner child (who already spent her allowance). 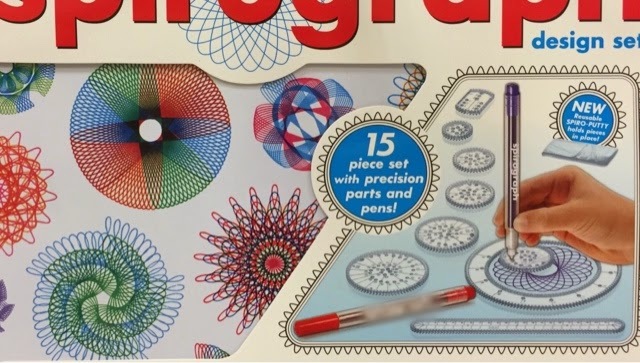 Instead, I 'shared' the nostalgia moment via a snap texted to my sis who has some impressive Spirograph creations on her resume (the one that earned her an imaginary corner window office with sign on the desk of 'Best Youngest Big Sister'). Memories of simpler times. Joy-filled hearts. Made me cry. Hugs. "I don't believe it - I just don't believe it - the things I can do with my Spirograph...!"